The new update of Gmail inbox has raised the issue of the necessity that employers feel to manage their inboxes properly. Because, who has never ever felt panic about opening his inbox for fear of finding dozens of unread messages? Start with a “0” Inbox. Nobody says it’s easy, but it’s not impossible and you have to do it at least once. Although the first time the process can take some hours, a “clean” inbox is the indispensable starting point. Don’t transform your e-mail into a tasks warehouse. Lot of the emails you receive are, actually, orders from other people asking you to do something. If we accept to have some of our tasks in our inbox, we assume we will have to check all our emails over and over again in order to find which of them are tasks, with a consequent waste of time. Tasks should be written down on a separate list, they should be managed through a different system. Choose the right moment to answer yor email. Don’t get stuck on it to the degree of checking constantly if you have new messages and, above all things, don’t use email as a way of procrastination. Did you know that some people are addicted to email? Nearly everyone starts the workday cheking the inbox, what is a direct way to lose the control of your own priorities. It should be you who plan your own agenda, or the rest of the day would be on other people’s hands. Always take action. If you open an email it is because you are going to do something with it, you are going to reply to it, file it, transform it into a task or delete it. Never let it simply stay in the inbox, without making a decission about it. Create folders, groups, tags. Use colours. Everything that could be useful to categorize your messages and locate them better. Set up your inbox to see messages as conversations. Doing this, you could manage all your emails attending to the issue but not the date they were sent. This helps to look up specific issues. Be brief, go straight to the point when you reply. Usually, when you are brief you receive short answers. Select send Automatic Replies while on a trip. The classic “Out of the Office” will let your partners know that you will take some time to answer their messages, and you’ll feel relieved. Set a filter for your messages and unsubscribe with no mercy. Cancel all newsletters, promotions and spam that flood your inbox. Think about of those senders you never reply to, those who never send interesting information and filter them. 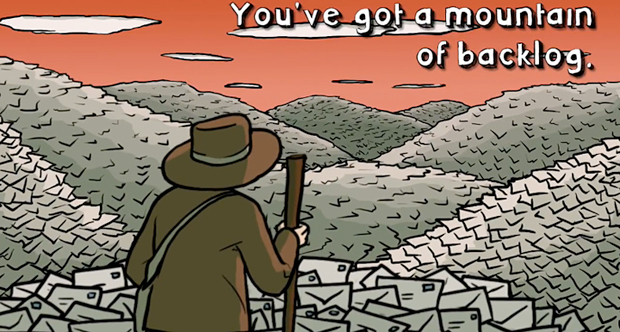 So… How good are you dealing with your email? How do you usually manage your inbox? How many times a day do you check it? Are you an email-addict? Share with us!